FARGO, N. D. –– The Fortune 500 company answerable for building the Dakota Access Pipeline across unceded 1851 Ft. Laramie Treaty territory is seeking $1 billion in damages in a new lawsuit against organized opposition involved with the Oceti Sakowin (Great Sioux Nation) struggle to block the private oil infrastructure project. The company, Energy Transfer Partners, which led the consortium that began pumping the oil through the controversial $3.7-billion pipeline June 1, filed the massive claim in North Dakota U.S. District Court on Aug. 22, naming as chief defendants the non-profit human rights and environmental watchdogs Greenpeace, Banktrack, and Earthfirst!. The claim implicates Earthjustice, the law firm that launched the Standing Rock Sioux Tribe’s ongoing litigation against the U.S. Army Corps of Engineers. The tribe is suing the Corps for failing to adequately consult tribal leaders on the cultural and water issues raised by locating the oil conduit a half mile up-river from the closest Indian reservation drinking water intake in the Oahe Reservoir. Defendants labeled the claim a SLAPP, or Strategic Lawsuit Against Public Participation, and called it an attempt to silence water protectors, as pipeline resisters dub themselves. These so-called John and Jane Does include “among others, cyber-hacktivists, environmental activists, and certain foundations directing funds to the defendants,” the lawsuit states. The language of the lawsuit resembles that used by Energy Transfer Partners’ international counterinsurgency surveillance consultant BlackSwan, a wartime private security guard outfit, which is currently being investigated by the courts and two North Dakota agencies. BlackSwan is under scrutiny for violating state permit requirements in running the joint private-public emergency operations that resulted in the injuries, arrests, and detentions of hundreds of pipeline opponents during a seven-month siege near Standing Rock Sioux Indian Reservation ending in February. In contrast, the non-governmental organizations charged, are registered to operate in North Dakota. “This case involves a network of putative not-for-profits and rogue eco-terrorist groups who employ patterns of criminal activity and campaigns of misinformation to target legitimate companies and industries with fabricated environmental claims and other purported misconduct, inflicting billions of dollars in damage,” Energy Transfer Partners’ lawyers said. “The network’s pattern of criminal and other misconduct includes (i) defrauding charitable donors and cheating federal and state tax authorities with claims that they are legitimate tax-free charitable organizations; (ii) cyberattacks; (iii) intentional and malicious interference with their targeted victim’s business relationships; and (iv) physical violence, threats of violence and the purposeful destruction of private and federal property,” they said. The case makes use of Vogel Law Firm, a North Dakota business, required for filing in that state. However, the bulk of the attorneys of record are from Kasowitz Benson Torres LLP, a favorite New York legal office of U.S. President Donald Trump, who is a former Energy Transfer Partners board member and received campaign financing from the company’s CEO Kelcy Warren. “This is the second consecutive year Donald Trump’s go-to attorneys at the Kasowitz law firm have filed a meritless lawsuit against Greenpeace. They are apparently trying to market themselves as corporate mercenaries willing to abuse the legal system to silence legitimate advocacy work,” Greenpeace USA General Counsel Tom Wetterer responded. 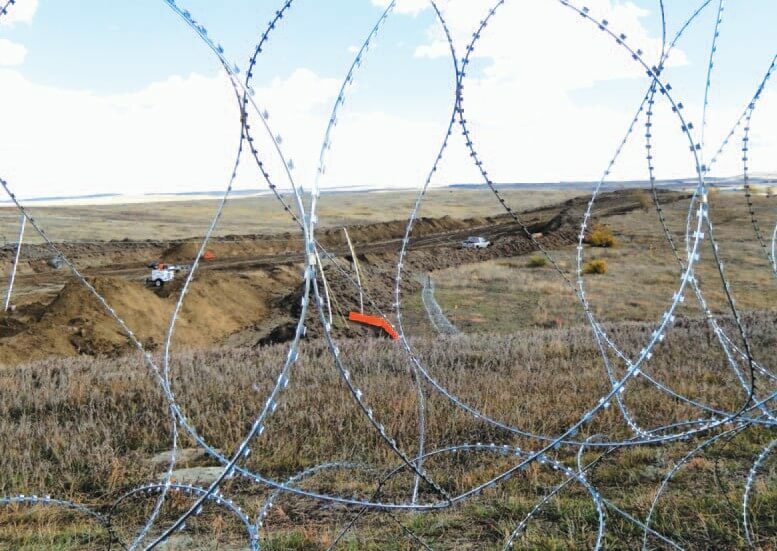 The lawsuit alleges that the defendants worked with numerous others to create “the Enterprise” that “urged Standing Rock Sioux Tribe and other peaceful protesters to establish protest camps” in private and U.S. Army Corps of Engineers jurisdiction near and on the reservation. “The Enterprise then cynically planted radical, violent eco-terrorists on the ground amongst the protestors, and directly funded their operations and publicly urged their supporters to do the same,” according to the suit. “Defendant Earth First! provided $500,000 of seed money to a core group of violent eco-terrorist infiltrators, who then formed what would be known as Red Warrior Camp,” the filing continues. “Red Warrior Camp operated as a rogue group at the protest site, refusing to work collaboratively with the tribe or the protestors’ various ad hoc governing bodies. “Greenpeace also organized donation drives to fund, feed, and house the militant group in 10 cities across the country. Red Warrior Camp advertised their violent confrontations to secure additional funding, and used other illegal means, including selling drugs bought with donated money to other protestors at the camps to finance their operations and line their own pockets,” it alleges. The claim attempts to pin results of state and private militarized crowd control on Red Warrior Camp, stating, “Red Warrior Camp initiated direct action training for its own members and other protestors interested in engaging in violent conflict and incited and perpetrated acts of terrorism and destruction of private and federal lands. “The violence at the camps escalated in tandem with the establishment of Red Warrior Camp and the Enterprise’s misinformation campaign. The Enterprise maliciously disseminated misinformation and prompted on-site violence for its own financial purposes and not because it was in the tribe’s interest. 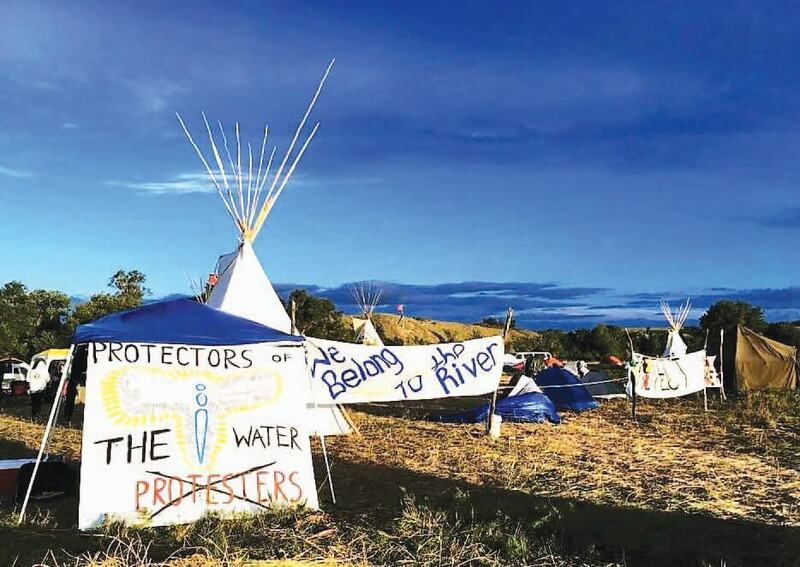 “Indeed, ultimately, the tribe sought to evict Red Warrior Camp from the protest site in November 2016. For the next six months, the defendants and Enterprise members used this manufactured crisis to relentlessly campaign against DAPL based on a series of demonstrably false lies and illegal activity designed to publicize those lies,” it said. Lumped into the Enterprise for the sake of the argument are: the grassroots non-profit Bold Alliance, comprised of pipeline resisters in Bold Nebraska, Bold Iowa, Bold Oklahoma, and Bold Louisiana; the California-based international nonprofit Rainforest Action Network; the New York-based global climate justice non-profit 350.org; and the Sierra Club. Also painted as part of the Enterprise are Jessica Reznicek, Ruby Montoya, and Mississippi Stand, described in the lawsuit as “one of the militant eco-terrorist groups that participated in the Enterprise’s campaign,” Climate Direct Action, Veterans Stands, Michael Wood, Wesley Clark, Jr., and Democracy Now, a national daily news program. “The common purpose of the Enterprise was to act as a parasite on the primarily local, indigenous objections to DAPL, and use those concerns to manufacture an international media frenzy based on sensational lies that could be used to raise funds, advance the ulterior motives of the Enterprise members’ major financial supporters, pressure plaintiffs’ business partners and investors to sever ties with the company, and incite illegal and violent attacks,” the lawsuit states. Calling the allegations “outrageous,” BankTrack said they are the plaintiff’s attempt “to silence civil society organizations and to curb their crucial role in helping to foster business conduct globally that protects the environment, recognizes the rights and interests of all stakeholders, and respects human rights. This attempt is bound to fail,” BankTrack stated. A Defund DAPL divesture campaign these organizations promote has resulted in the withdrawal by individuals of nearly $85 million from banks with loans to Energy Transfer Partners and associates in the pipeline that reaches nearly 1,200 miles from the Bakken fracking fields of the Ft. Berthold Indian Reservation in North Dakota to a transfer station in Illinois. Cities have divested more than $4.32 billion. Five banks have opted to withdraw their participation in financing the project. In the suit, Energy Transfer Partners claims that plaintiffs have suffered damages of “no less than” $300 million. They argue they are “entitled to recover” three times that much from defendants, in addition to costs, interest and attorney fees. Greenpeace says that Strategic Lawsuits Against Public Participation “are often filed without any kind of merit, just to cause financial harm to individuals and organizations who have to hire lawyers and engage in costly legal battles to continue their work. Greenpeace should know. It was already facing two multi-million dollar suits in Canada, before this one came along. The organization claims the purpose is intimidation. “Corporations are getting SLAPP-happy,” it said. Some 28 state legislatures have enacted anti-SLAPP laws but SLAPPs are on the rise anyway, it said. Water protectors claim the 1851 Ft. Laramie Treaty reserving Lakota Territory for the Oceti Sakowin is violated by the trespass of the pipeline, in contradiction to Article VI of the U.S. Constitution, which states that treaties are the supreme law of the land. This article was originally published at Native Sun News Today. It has been re-published at IC with permission.